Republicans are hoping the Singapore summit will boost the President’s approval ratings, but summit meetings have historically had only small effects. Nor were those effects uniformly positive. The problem with this theory is that summits have had limited effects on presidential approval ratings. Using the job-approval data from Gallup I compiled the average approval score for roughly the two months prior to a summit and the two months following and calculated the change as shown below. Most summit meetings have had only marginal effects on the President’s popularity on the order of a few percent up or down. Nor can we attribute all the changes we see to the summits themselves. For instance, the fall in Ronald Reagan’s approval ratings after his Washington summit with Mikhail Gorbachev in 1987 resulted largely from the revelations of the Iran-Contra scandal which appeared soon after the summit. Nor do all summit meetings improve the President’s image. The 1974 meeting between Gerald Ford and Leonid Brezhnev led to the SALT II accords, but they were denounced by Republican opponents like Ronald Reagan and criticized by major newspapers like the New York Times. 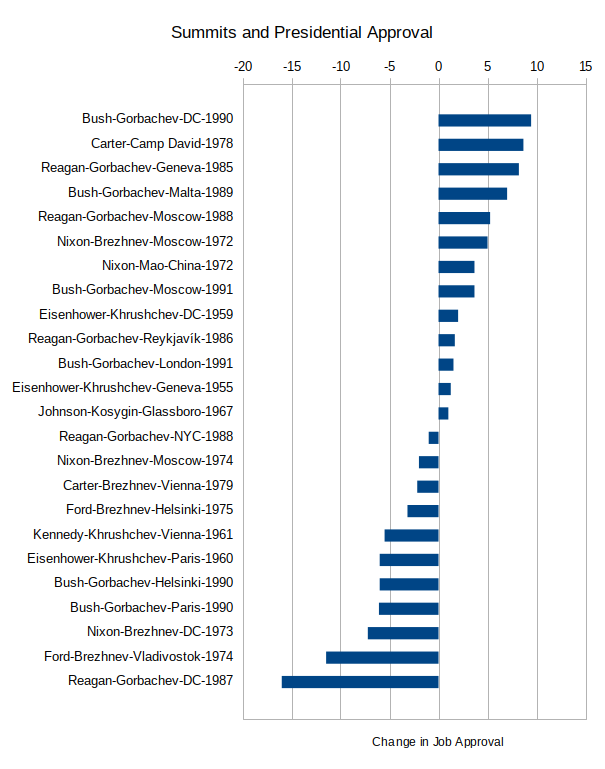 A number of summits considered important by historians had little influence on public opinion. Even an event as tumultuous as Nixon’s trip to China in 1972 increased his approval rating by less than four points. Kennedy’s supposed failure to stand up to Khrushchev in Vienna cost him a bit over five points. A year before Khrushchev had stormed out of the Paris meeting with Eisenhower over the U-2 crisis. Eisenhower’s popularity suffered a slightly larger hit. As I wrote earlier about the effect of the Syrian bombings, opinions about Donald Trump are much too crystallized to react to something like a summit. And if the intention was to influence the fall election, why didn’t Trump hold out for a meeting in September or October when it might have mattered? Few voters will be taking the Singapore summit into account when they go to the polls in November. Update: I added Jimmy Carter’s involvement with the Camp David accords in September, 1978, to the list. His approval rating rose substantially in the short term, from an average of 40.8 in the two months before the summit to 49.5 in the two months thereafter. His approval scores were already moving upward after hitting a nadir of 38 the previous July, but they did jump five points between the poll earlier in September and the next sounding in October. This bump in Carter’s approval persisted through the November, 1978, midterm election. Perhaps Trump should have waited until the fall to meet with Kim.